So how does the WiiWare version of Cave Story stand up to the original? I couldn't tell you, as I've never played the PC version. For those of you who, like me, have been in the dark, Cave Story is a shooting platformer along the same lines as Nintendo's Metroid. The player awakens in a cavern with no idea how he got there, and soon finds himself thrust in the middle of a conflict between the peaceful, rabbit-like Mimigas and the evil Doctor, who is kidnapping the Mimigas and using them for his own vile purposes. Yes, I've never played Cave Story before. When creator Daisuke Amaya released the game as a freeware PC title in December of 2004, I was hip-deep in the newly-released World of Warcraft, which dominated my time spent in front of the PC for several months. I'd heard good things about the retro-styled platformer, but I never got around to actually partaking. When the WiiWare version of the game was revealed, I was well aware of the excitement surrounding the news, but once again, without any experience, I didn't know what the excitement was all about. Utterly Charming: Charming is a word I tend to fall back on when describing retro visuals, but in Cave Story's case I'm not simply talking about the sprites. Yes, the Mimigas are adorable, and some of the enemies you fight are ridiculously cute (Just what the hell is Balrog? A toaster? A lunchbox? ), but the story of the struggle between the rabbit-like creatures, the vile Doctor, and the Sakamoto family is every bit as compelling and, at times, charming as the graphics. Even with all the death and destruction that goes on, you can't resist the allure of a robot with a puppy on his head. You just can't. The New Old-School: While the inspiration from games such as Metroid and Mega Man is readily evident, Cave Story never feels like a derivative of those classics. Instead, its combination of retro graphics and old-school platforming mechanics feels like more like a refinement, taking elements from those beloved titles and smoothing out the rough edges. The ability to upgrade your weapons using energy dropped by enemies provides an interesting, Gradius-like twist to the run-and gun action, and the controls are excellent, with tight shooting, precise movement, and enough float to your jump to allow you to make difficult leaps without wanting to hurl your Wii remote through your television screen. It's less like playing a retro game, and more like playing the romanticized idea of one. Ramping Up The Challenge: Cave Story's difficulty curve is one of the sexiest curves I've seen in quite some time. The game starts you off with simple running and jumping, and then adds new weapons and devices to master at regular intervals. Just when you think you've mastered the game and the rest will be a cakewalk, some new creature, boss, or level design element crops up that has you rethinking your strategy. The game constantly throws new challenges your way without getting unduly frustrating. The pacing is simply perfect. Have you ever gone back to play an old Nintendo, Sega Genesis, or Super Nintendo game that you used to love, only to find that it didn't play quite like you remember it playing? It's as if your mind only stores the good elements of the games you've played in the past, and revisiting them uncovers flaws you might not have seen back when you first plugged in the cartridge and took game pad in hand. It's like you have two games: the actual game, with all its flaws, and the ideal game, molded into near perfection by your imperfect memory. For me, Cave Story is that ideal game. It isn't simply reminiscent of the games I used to play as a much younger man; it's what I remember them to be. 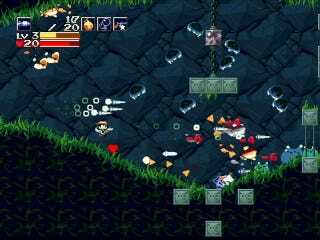 Cave Story was developed by Studio Pixel, polished and published by Nicalis on WiiWare on March 22. Retails for 1200 Wii Points ($12). A copy of the game was given to us by the publisher for reviewing purposes. Played through the single player story mode on normal difficultly, toying with Boss Rush and Sanctuary Time Attack modes. Total play time approximately 10 hours, with much more to do.